Whether you are looking for a quick day trip, to hold a conference or an extended camping trip, Silver Falls State Park offers something for any length of stay. "You can do everything from drive through the park and see a couple of falls from the road to setting up a tent and staying here for several days," says Steve Janiszewski, assistant area manager. "What you do at the park really varies on how long you want to stay." The park, which is an Oregon state wildlife refuge located northeast of Salem, spans more than 8,700 acres and is the largest, and most diverse, park in the state. Visitors can do everything from camp, hike, bike, horseback ride, picnic, visit historic buildings and even drive through the park. There are 22 miles of trials that are shared by mountain bikers, hikers and equestrians - making a visit to the area an all day or all-week adventure. The focal point of the park is the collection of waterfalls. There are 10 falls and more than 22 miles of multiple use trails leading to them. In fact, trails take you behind the popular 177-foot South Falls and as well the 136-foot North Falls. Both waterfalls are easily accessible from nearby parking lots. With the city of Silverton just a few miles away, visitors can enjoy a rustic stay at the park or take advantage of one of the bed and breakfasts in the area. A day-use pass is $3 and if you stay overnight at one of the campgrounds the $3 is included with fees associated with staying that the campground or in one of the park cabins. "We try to make it as inexpensive as possible while still trying to cover costs," Janiszewski says. "If you plan on visiting the park again in the same year - or staying for an extended period - I would recommend the $25 yearly pass." One of the main attractions for the park is the possibility of seeing wildlife during your stay. Whether you are interested in watching the many wild birds or looking for a glimpse of a deer, or even a bear, the park offers one of the best places to go to watch nature. "We have so much wildlife here, sometimes it's a challenge with the squirrels, chipmunks and crows, but seeing deer and beaver make it all worth it," Janiszewski says. The vast array of wildlife also has its challenges. Janiszewski and his staff know about the bears and mountain lions in the park, and warn people what to do if faced with one of these scarier visitors at the park. "We have never had an attack, but we like to keep people aware of how to handle it if they meet something larger out on the trails," he says. "Our challenge is in the spring with the bears. We really ask people not to feed them, or they are around for the entire season." There are brochures and a fact sheet on the park's Web site which give people advice on what to do if they run into a bear or mountain lion. "Mountain lions are nocturnal, so people will catch a glimpse of them sometimes, but not too often," he says. "People mostly come here to get away from it all and see nature in a setting that isn't surrounded by a bunch of other people." Janiszewski says the park was large enough that if you take the time, you can get away from most other people to enjoy the quiet. "It's a great feeling to walk down a trail and stop and realize that there isn't another person around for quite a ways," he says. The busiest time of year at the park is the spring and summer - the park is open year round but conditions vary from rain, and sometimes snow in the winter months, to sunny weather in the summer. "People should dress in layers and have a good set of walking shoes if they are planning on doing much hiking,"
Janiszewski says. "It's Oregon, so sometimes we have rain and sometimes it's sunny and wonderful." 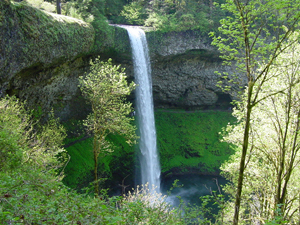 About Silver Falls: Featuring 10 waterfalls and more than 22 miles of multiple use trails, Silver Falls is Oregon's largest state park. Visitors can bike, horseback ride, camp, drive, and hike or even have conferences at the park. Located 26 miles northeast of Salem, the park is close enough to the Willamette Valley to be a great spot for day-trips. The park has a conference center, cabins and offers horse rentals from Memorial Day to Labor Day. For more information, including trail maps, activity lists and directions to the park, visit the Silver Falls State Park Web site.